We are knee-deep in author studies here at The Classroom Nook! If you are just checking in for the first time (HI! and...), make sure you read part 1 and part 2 of this series all about choosing an author and choosing books for your study. Those two posts will give you some important information that today's posts builds upon. Hopefully by now you've given some thought to an author that you think might work well with your students. Maybe you've even had a chance to flip through some of the books you're considering for activities and lessons in your study. And - if you answered "nope" to those questions, no worries! We'll get you there! In part 3, I'd like to get specific about what your author study might look like in your classroom. The beauty of an author study, as I have mentioned before, is the ability to mold it and craft it to your current classroom set-up and teaching style. FORMATTING YOUR AUTHOR STUDY: WHOLE-CLASS, SMALL-GROUP, OR BOTH? 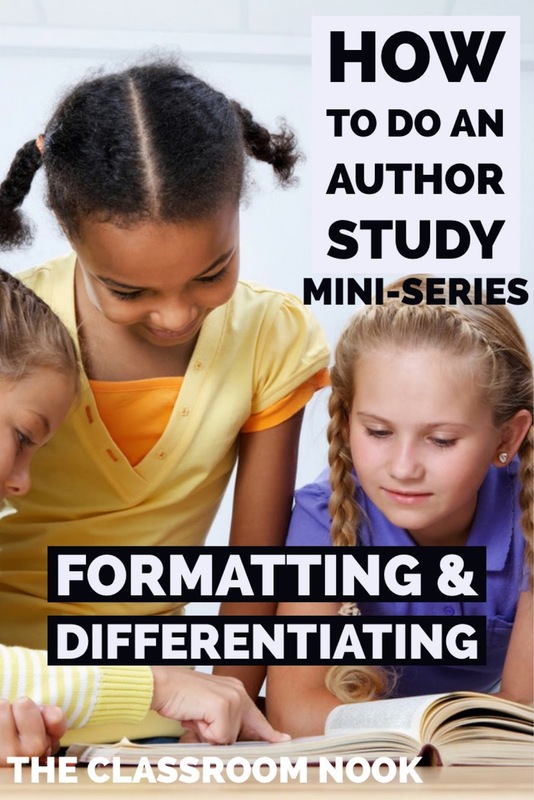 Although you may lean towards one more than the other, chances are you might be doing a little bit of both; whole-class AND small-group instruction as it related to your author study. 1) You may choose to have a "read-aloud" author study with your whole class. This is where you will read the majority of your author's book as a read aloud, inviting students to participate in discussion and point out things that they notice in the author's books. This is a great opportunity to create student-led anchor charts, jotting down things students notice about the author's writing style, characters found in the books, or other things students take note of while reading. And - since you'll be with them the whole time, your instruction can guide the discussion. One of the benefits of doing an author study this way is that it allows you to choose authors that may have text levels above your students' individual reading abilities. Instead, while listening, students can focus on the text. 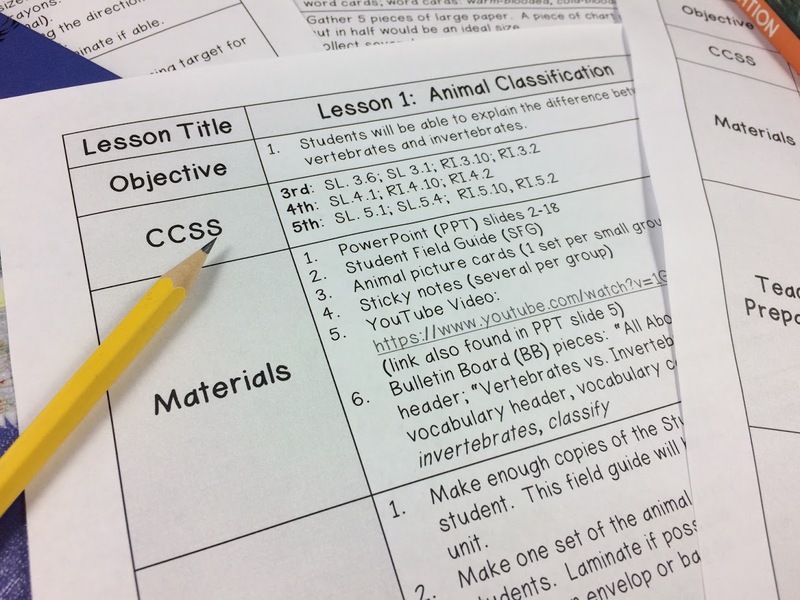 During this type of author study, students can complete response activities on their own or in groups following the read-aloud portion of your lesson. In addition, once you have shared a book with your students, they are free to reread the story on their own to further interact with it, if desired. Picture book author studies make great "read-aloud" author studies. Students can focus on illustrations while you share the story with them. 2) You may choose to have a combination of read-aloud texts and student-led reading. (PS- This is personally my fave!) 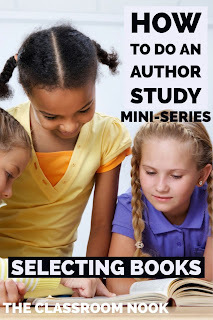 In this type of whole-class author study, you would choose some books to do as a read-aloud while other books would be read by the students in partners or groups. You could model a strategy or skill using your read-aloud and then provide students with a second text to apply what you have taught them during the read-aloud (you will, of course, need multiple copies). In any case, it is the goal of the author study for students to begin making connections between the books. Student groups were assigned different books by Eve Bunting. 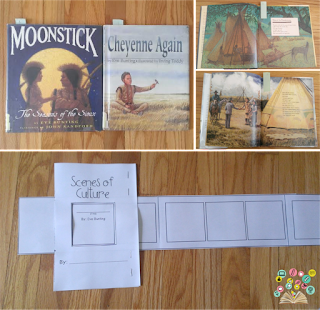 Some groups read Moonstick, a much easier, poem-like text for my lower-leveled readers, while other groups read Cheyenne Again, a more text-heavy story for my high-leveled readers. Both books had similar themes (a big focus of my study) and could be used to complete the same activity. If needed, I could have differentiated my activity even more by working more closely with some of the Moonstick groups, while the other groups worked on their own, to make sure everyone was on track. Another differentiation option to consider, is to provide an audio recording of the book for students who could benefit from having it read to them while following along. I love this option, because it's the perfect stage for differentiated instruction! This might be a good option to explore after finishing a whole-class novel unit or even just a read-aloud by an author that the students really enjoyed. The author study would be a good follow-up unit, allowing students to dive deeper in that author's works. 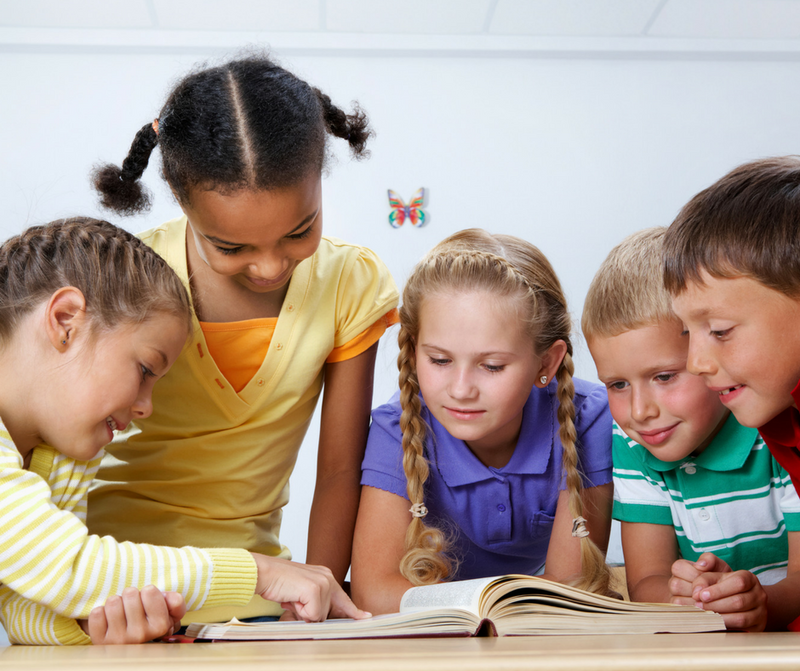 For example, if you have noticed that the students really enjoy a Judy Bloom book that you have been reading to them every day after lunch, you can launch into an author study on Judy Bloom by having students break into groups, reading different Judy Bloom books, respective to their reading abilities. Consider using the read-aloud book that all the students are familiar with as a model book in mini-lessons to teach skills and strategies as a whole class before having them work in their book groups. Choose an author that has chapter books at a variety of reading levels (Judy Bloom, Roald Dahl, Louis Sachar, and Andrew Clements are some authors that write books in a variety of reading levels). That way, you can differentiate for your students' varying reading abilities. One way of dividing students into book groups is to present each of the books to your students by reading the first chapter or first few pages, giving a summary, or giving a "book talk" where you advertise the books to your students. Then, allow your students to write down their top 2-3 choices. At that point, you can take their requests into account when grouping students. You might have some students who want to read books that you know will be too difficult for them. Perhaps you can pull them aside and "sell" them another book that you think might be more appropriate. Be sure to put students together that you believe will work well together. Be mindful of the group's size. Too large of a group could get chaotic, while too small of a group could lack energy. It's OK if two groups are reading the same book, if needed for sizing purposes. Be prepared to break groups apart if they are not functioning properly. These groups might need to be reorganized or even absorbed into other groups that are working well. Once your students are in their groups, they can read together, use discussion prompts, and complete reading responses and activities related to the group's book. While students are in their groups, you are free to listen in on individual groups, provide support and insight, and even make informal observations about your readers. Another thing to consider is how you will tie all the books together. Even though students won't be reading each book by the author, I suggest having a sharing time about once a week where you invite a reader from each group to read a portion of their book to the class. They can choose an exciting part from the book, a critical event, or something else that ties into a skill or strategy that you are working on as a whole group. For instance, if you're having students focus on the characters in their books, then perhaps have each group choose a section from their book that really highlights one of the strong characters in the book. Use this time as an opportunity to create anchor charts comparing the different books, or create a list of ways the author creates a strong character. This in turn could help your students in their own writing as well. It might even inspire students to read the other titles on their own! Depending on how your reading instruction is currently set up, these small-group author studies may function as guided reading groups. Meaning - if you're used to meeting with guided reading groups while the rest of your class is doing independent or center work, all of that can carry on as usual! You would simply use your guided reading time to conduct the author study with the different book groups. If you're looking to have all of your book groups reading at the same time, then literature circles are a great alternative. 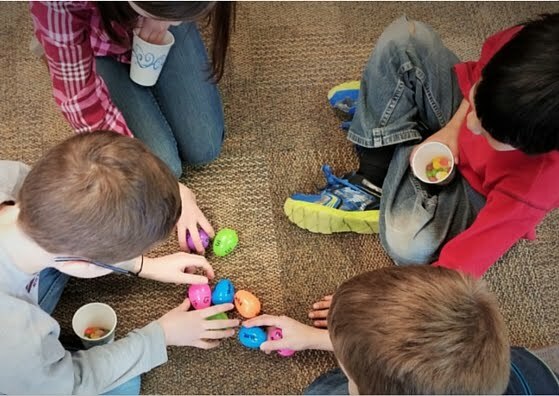 Literature circles shift the focus from teacher-guided instruction (like the traditional guided reading format) to a more student-driven book discussion. In a literature circle, students take on different roles that all contribute to the discussion and life of the book group. To learn more about literature circles, check out this unit. have groups complete a daily/weekly journal where they record highlights from their discussion, indicate where they are in the book, next steps...etc. 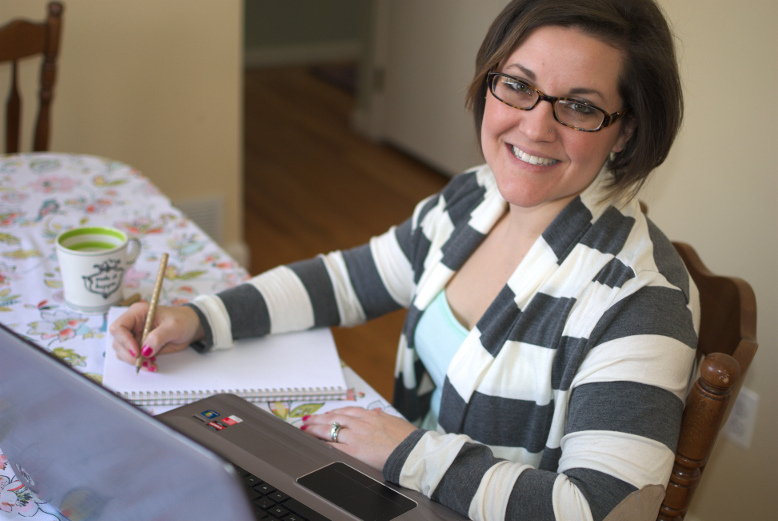 "What activities and responses should my students be doing in an author study?" Well, hold your horses, my friend, I'm gonna lay it allll out for you in the final installment of this mini-series. We're going to cover how you can tie in the skills and strategies your students need to learn and practice through the activities you have your students complete.